« How Effective is EFT? I use essential oils (the natural, aromatic volatile liquids found in shrubs, flowers, trees, roots, bushes, and seeds) in my massage practice (at no additional cost to my clients) because combining these oils with massage therapy creates a relaxing, luxurious experience that balances the mind, body, and spirit. Considered mankind’s first medicine, pure essential oils made from all natural plant sources also have amazing therapeutic properties. For example, Peppermint oil is excellent for relaxing tense muscles. Lavender oil (also relaxing) is renowned for its skin-enhancing benefits. According to ancient Egyptian hieroglyphics and Chinese manuscripts, priests and physicians used oils thousand of years before the time of Christ to heal the sick. I use only 100% pure, natural, uncut, therapeutic-grade oils made by Young Living. I have also developed a number of custom blends of my own that rapidly reduce stress and relieve pain. 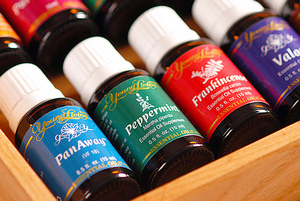 You can learn more about the oils I use and recommend on my Young Living Essential Oils page.